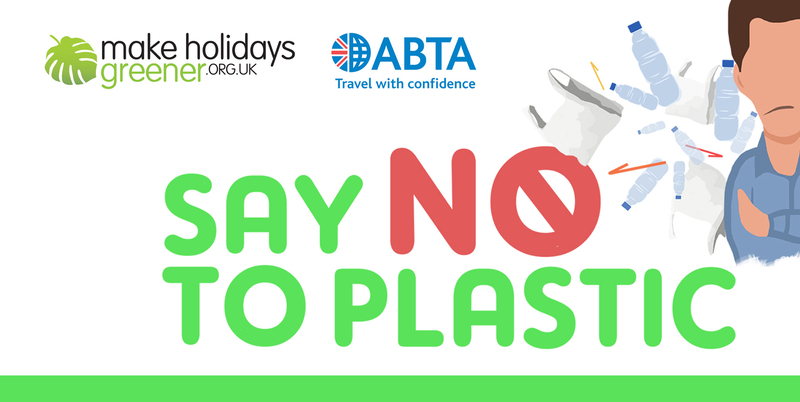 This year ABTA’s theme is ‘Say NO to Plastic’ and what a brilliant theme it is. They decided this building on the momentum of David Attenborough’­s Blue Planet II series which has increased the public’s awareness of the damage plastics can have not only on the environment but also on the animals. And the best thing about this campaign is that everyone can get involved! ABTA want all their customers to get involved with this pledge with simple actions which are easy to maintain but have a big impact on the environment. They have even created reusable cotton bags for people to use with the Make Holidays Greener logo. For Funktion Events, anything that helps the environment gets a big yes from us anyway but ABTA’s annual campaigns get bigger and better each year so it would be a no brainer not to get involved! 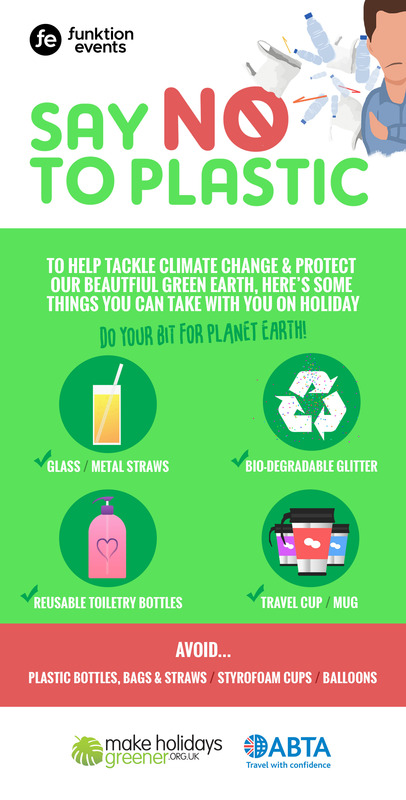 But to make things easier for our customers we have come up with a few ways you can ‘Say NO to Plastic’ during your holiday. Sometimes for some people the most exciting part of packing is buying yourselves the miniature bottles of toiletries you already have at home. Let’s be honest we are all guilty of falling for the mini deodorants and shampoos. But this year why not save the environment (and your money) by investing in reusable toiletry bottles. They aren’t too expensive to purchase and you can use all of your favourite toiletries that you have the full sizes of at home! Simply fill each reusable bottle with your favourite shampoo, body wash and lotions and you are good to go. We all know the debate about the dreaded plastic straws. Most of them are too lightweight to make it through the mechanical recycling sorter which means they end up in our ocean. Once they are in the ocean it is estimated around 71% or seabirds and 30% of turtles have been found with plastic in their stomachs. To avoid this opt for a metal or glass straw, you can buy these almost anywhere online now so you can still enjoy the use of a straw without bringing harm to sea life and the ocean. On Holiday (especially for you girls) glitter is always a part of the make up routine. Most glitters you put on your face are harsh plastic glitters which definitely aren’t good for the environment but Eco Glitter Fun have created a biodegradable glitter that is great! It has passed all the official requirements it needed to for composability as well as adhering to the European and American standards. The glitter that has been produced is a very stable and the biodeg­ra­dation is only initiated in soil, compost or a waste water/ocean environment where micro­or­ga­nisms are present. If you are travelling abroad you will be guaranteed to be drinking a lot, whether that’s water, an iced drink or an alcoholic one. And most of them drinks will be given to you in a plastic cup which will then eventually end up in the bin. Avoid this waste of plastic by investing in your own reusable travel mug or cup, this way you are saving however many plastic cups you would have used over your trip. And if you’re on a group holiday or a stag or hen do why not all chip in and order personalised matching cups as a momentum of your trip? The Make Holidays Greener campaign is also encouraging all holiday makers and companies to make a difference and take a positive approach with social and environmental actions. If you visit their website, you can make a pledge to make a difference and if your pledge is made between June 1st and August 31st you are entered into a prize draw to win a GoPro camera with a waterproof casing! The perfect prize to win for your holiday whilst helping the environment.